Online Exam System is designed for Schools, Colleges, Universities, Institutes, education establishment places and employment agencies similar to our Examination Management System. Online Exam system is best suited for the graduate programs. Our exams can be conducted individually or as a group of students like classes. Online Exam System is a cloud-based system which provides seamless operations, resilience, quality and full availability. Any number of students can be added to the examination, more importantly, students are able to take examination anywhere else in the world. The same examination can be taken anywhere anytime, our system has built-in time zone rules which enable this friendly and necessary functionality. With our random selection of generating examination allows unique examination per student which gives less degree of cheating and uniqueness globally. Online Exam Management System has no limitation regarding subjects or topics, our Exam Builder is designed to handle any number of questions within the exam. Any number of examinations can set with a mixture of topics, for instance, science examination physics, Chemistry, Biology, Nuclear Science and Live Science can be added. This gives the examination board total facility to develop and enhance any kind of examination required. It benefits all the examination boards in the world. In a simple term, examination consists of a number of topics and every topic can have any number of questions. Every question has a number of attributes to allow multiple competency levels for students. Online Exam Software facilitates us to view exam results of students or candidates. Examiners can allocate marks to the subjective answers manually. Examination marking plays a major role either achieving great results or disputing marking or numbering system. With our System invigilator can be challenged as per question and sub answer marking analysis is visually possible. Online Exam System has facilitated us to define an exam question level. Every exam question can have the quality and the competency level, which will provide the exam quality level for a student. Its difficulty level helps to find out for people with difficulty level and questions can be added as desired. This is to facilitate schools to evaluate student’s ability to acquire and capture knowledge and proof by improving performance in the examination. Online Exam System complex difficulty level enables school, university and colleges to find out the best people in the institute and organization. Online Exam System with its unique language editor allows multiple foreign languages. Online Exam System allows questions to be set in multiple languages. Answers can be given in Multiple Language. With this advanced functionality, it makes it a unique system worldwide. Online Exam System provides natural Subjective Question and Answers. This facilitates all the written exams. Please contact us for a free online exam system and free online exam software. Online Examination system allows any number of students to take part in the examination simultaneously. Our system is deployed on the cloud which runs 24 x 7. Our system provides multiple examinations like English, Mathematics Geography and any other subjects. Online Examination System questions are based on the topics with no limitation on a number of questions and number of topics. 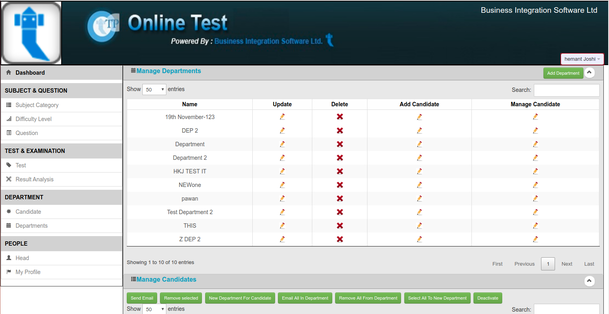 Online Examination System has an Examination Builder Software engine. Examination builder engine enables to build the required level of online examination for individual needs. Online Examination System can have single, multiple with all apply, multiple with relevance and subjective questions. Questions can be a single choice or multiple choices with six options containing text and images. The question can be written descriptive where marking is left to the examiner or invigilator directly. Examination Writing Software enables description writing questions. Online Examination System questions are created based on category, exam sub-category or exam topic. Examination Question difficulty level for question bank enables to set exams and questions at a different level. Online Examination Software allows setting multiple difficulty levels. 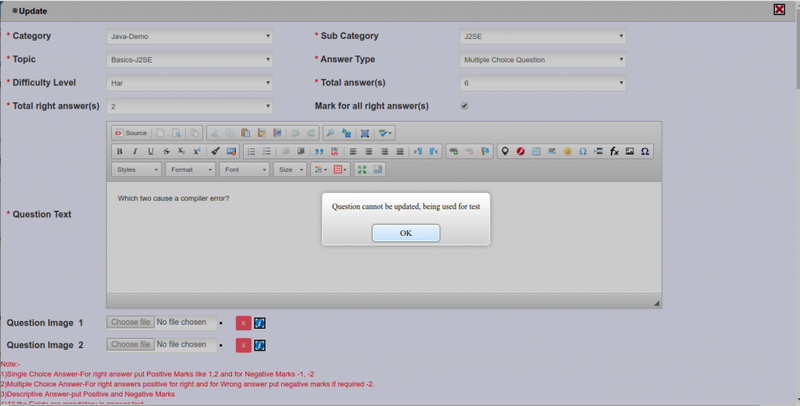 Any types of examination question can be added to the question bank and then can be used by an exam builder. Exam builder and question bank software are integral complements each other and are code part of the Online Examination System. Online Examination System is designed with the next level of examination system providing cloud-based software where a number of students can take the examination through Examination System. Online Examination System encourages students to raise their competency level. With advance difficulty level management various levels can be set to facilitate student at any level. Student login is secured only one student can take an online examination at any time. The Student examination is monitored and examination is automatically closed when student examination times out or allocated time expires. Online Examination System session management automatically times out if another student tries to make an attempt with the same credential. Online security provides double protection for students for examination. All examination can be synchronized at a given time and only triggered when examination time is due. Online examination system provides multiple and single user credential facility which is propagated across the user session. School, College, University or Institute companies anyone can use Online Examination System for Students. Online Examination System for Students is totally adaptable with a built-in permissions control engine. Administrator or Head can be given full accessibility or designated permissions through the Online Examination System for Students. Online Examination System for Students with right permissions, administrator are able to design a dashboard for students, head teachers and faculty separately. Online Examination System for Student is secure and well suited for sensitive student examinations. Its cloud-based technology provides additional benefits. Online Examination System for Students is web-based and allowed on all the devices which allow students to take the examination on their laptop or tablets saving resources and energy for schools. Online Examination system for School with question bank database and answers images allow the online exam to be built with a mathematical equation, formulas or exam can be set for Art or any science subjects. Online Examination System and Question bank database is a suitable candidate for Science and other related exams. Online Examination System for Students allows multiple candidates and students within class and department. Student class can have hierarchical levels. With the online exam system for students, all the exam possibility exists. All the exam questions can be created within the system no other overheads are required. See Multiple Choice Question Software. For students, answers play a major role in the exam. Our online exam system has a built-in negative mark, positive marks and more importantly adaptive marks are available. Our marking policy is suitable for different scenarios to filter out competent and non-competent students. Online Exam System for Students consequently supports in different languages makes it a language friendly exam system. Subsequently, as a result of countries like the UK, USA, and India where multiple languages are often used makes this a desirable and important exam system for conducting the online exams. With subjective and descriptive facilities makes tests and exams in English or Economics or Mathematics simpler. Online Exam System for Students having the ability to show results class wise or department wise gives HR and senior management to monitor training and programs and provide effective feedback. Please contact us for best exam software. Online Examination Management makes question and exam management easy to adopt at various levels. Provides comprehensive and Grammar school full control over exams and become one of the default standards for today’s examination management software. Online Examination Management prevents fraud logins and disables exams. 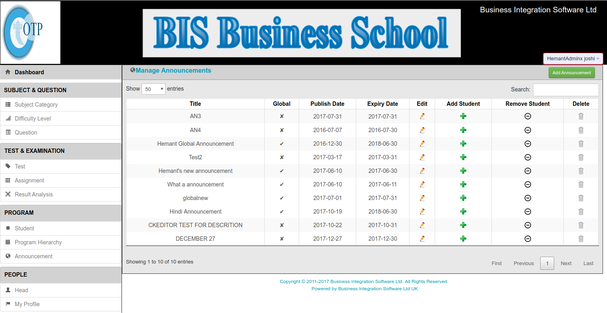 It has built-in the global announcement software module. With Online Examination Management for schools or colleges can make global announcements regarding exams for instance delay and cancellation, also has a local announcement for quick and rapid mock examination software. Online Exam System for schools provides a unique feature of subjective and descriptive answers. Subjective questions are marked by the teachers, which allows school flexibility to set guidelines for manual marking. 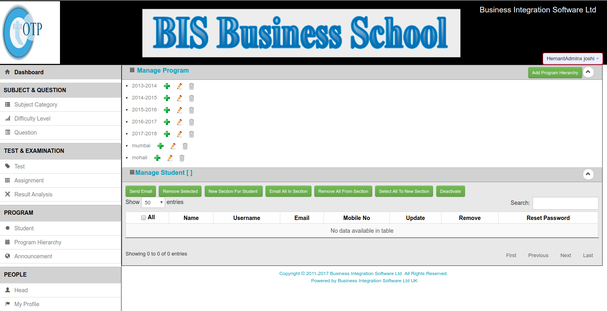 With Online Exam System for the school’s facility, all the objective questions are marked automatically and the selected question can then be marked by an examiner. Online Exam for Students does not distinguish between any exams allows students to take any kind of exam with a similar facility provided by the exam system. Check out Exam Writing Software and Exam Builder for Schools. Examination Management System designed for Administrator or Head of the department or manages where they can control a flow of examination as desired for their organization. Advance facility for administrators and managers is also an integral part of the management system, it shows the list of administrators, heads, manager to manage schools, colleges, universities, and institutes. Allows managers to have full control to manage human resources and students. School, College, University or Institute companies anyone can use Online Examination System. Online Examination System is totally adaptable with a built-in permissions control engine. Administrator or Head can be given full accessibility or designated permissions to the students. Web-based and allowed on all the devices which allow students to take the examination on their laptop or tablets saving resources and energy for schools. Exam system provides a facility to design and build a complex set of examination questions. All the facility for students is provided to answer the exam correctly. Exam System allows sequential or random examination question selection. With Exam System, actual exam is time bound. Which starts at a scheduled time and ends at a scheduled time. If an exam is not finished on time browser automatically submits to the Exam system. Exam System has manual adjustment facility to cancel, postpone or continue the exam. If an exam is terminated due to poor network exam system allows being re-scheduled. Any examination software needs to cater for failures. Exam System has a built-in failure to allow the student to repeat exam The Exam Software manager or admin has the facility to include exam as many times as the exam system allows. Self-management of a profile is an advance and integral part of the system. Each individual can manage their profile and system manage itself no human interaction is required. Built-in failure to allow the student to repeat an exam The admin has the facility to include the exam as many times as required. The exam is time bound. Which starts at a scheduled time and ends at a scheduled time. If an exam is not finished on time browser automatically submits. The Student examination is monitored and examination is automatically closed when student examination times out or allocated time expires. Automatically times out if another student tries to make attempt with the same credential. Online security provides double protection for students for examination. Manual adjustment facility to cancel, postpone or continue the exam. If an exam is terminated due to technical failures can be re-scheduled. Any number of students to take part in the examination simultaneously. Our system is deployed on the cloud which runs 24 x 7. Our system provides multiple examinations like English, Mathematics Geography and any other subjects. Questions are based on the topics with no limitation on a number of questions. It has an Examination Builder engine which enables to build the required level of online examination for individual needs. The question can be written descriptive where marking is left to the examiner or invigilator directly. Examination Writing Software enables description writing questions. Allows setting multiple difficulty levels. Any types of examination question can be added to the question bank. Our Exam Management allows banks and financial institutes to use for filtering candidates for their company. Simple to use can be employed by companies or recruiters as well. Customised results analysis with a breakdown per question allows departmental heads to weave out weak candidates and focus in depth for a question answered. Intuitive interface and easy to adapt for exams, it can be used on devices where internet facility is provided. It is web-based technology and can be used with any devices. Manage written question and objective type questions. Persists all the attempted question data in the question bank database. Which can be used to reconcile or provide grading information. One of the important features of the system is instantly marking the exam online and generating results. Automatically posts the results to the student, head of the department or any associate immediate results for the test which is just submitted by the student. In a large school with thousands of students and having a scale-able system supports natural and organic growth. Subjective questions are must, the best writing editor is provided for exams. Our editor for examination is internationally compatible making use of UTF-8 which can support multiple languages. All questions and their prospective answers are broken down in multiple choice question maker, single choice or subjective with various options. Can add up to 2 images per questions and one image per answer if required and 8 graphical representation for visual exams. Online Exam System has an intuitive interface and easy to adapt for exams, it can be used on devices where internet facility is provided. It is web-based technology and can be used with any devices. Online Exam System can manage written question and objective type questions. All facilities are built into our System. Online Exam System has many features that make it unique and separates it from other exam systems. Online Exam System persists all the attempted question data in the question bank database. Which can be used to reconcile or provide grading information. One of the important features of the system is instantly marking an exam online and generating results. Online Exam System automatically posts the results to the student, head of the department or any associate immediate results for the test which is just submitted by the student. Online Exam System provides multiple scale-able users using cloud-based technology. All data behind the cloud and virtual instance give 24 x 7 availability in the online exam system. Online Exam System is not a time zone dependent. Online Exam System has a built-in time zone calculator which allows all online exam to be centralized and taken in different part of the world or different part of the country. Online Exam Management allows managing student’s registration, student profile along with the faculty or educational agencies profiles. Assigns classes in the hierarchical order as per students age and level of competence. It provides an import facility to register students. This is the fastest way to upload the student using the spreadsheet. School Management has the ability to modify details manually. Student registration can be done via an excel file, manual on the system or automated using an advanced user interface. With advance answer, marking scheme eases pressure on faculties and gives perfect results automatically. Subjective marking defers the marking to the individual. Our cloud based system provides best online exam for students. Online Examination Management is best designed for the examination board to deliver at mass scale electronic examinations and provide them at the national level and International level. Our Online Examination Management is based on the latest cloud technology with no limit on resources allows any number of students to take the examination without restrictions. Allows multiple languages making countries like France and Canada and many others to enjoy multi-lingual for designing and taking the examination in their native language. With Online Examination Management number of retakes and repeats are allowed which facilitates less able students to utilize the full capacity of the system. Adaptive marking is possible. One of the advanced features is negative marking, adaptive is the advanced option for complex and more sophisticated institutes. Online Exam Management provides results breakdown and delivered in various format and results can be sent to various authorities. Student panel is capable of display past and current results. Online Exam System is intuitive, compatible and reliable for conducting any type of Online Exam (Objective Multiple Choice Question Software or Single Choice Question Software/Subjective). Our main purpose is to provide you with a simple, feature loaded and advance exam System to conduct online exams hassle-free. Online Exam System is a web-based application. This Online Exam system can be easily modified and customized according to the need of any Educational Institutions, Schools, Colleges, Institutes, Universities or in various Training Academies. Online Exam System is a cost-effective system for institutes, schools, universities and especially from a candidate’s point of view. 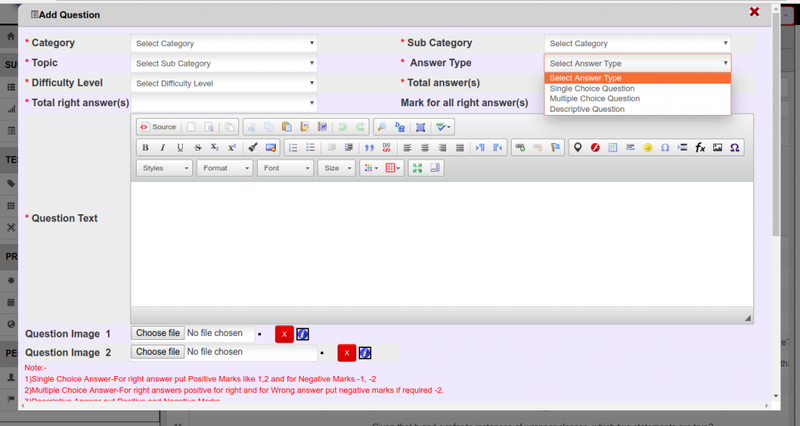 The system provides uniqueness security for exam questions as each student can get a random order of questions of the same subject, but doing this task is quite difficult for offline assignments. Question Bank Software persists question which can be dealt sequentially or randomly. We can generate multiple sets of unique exams in an effortless manner. 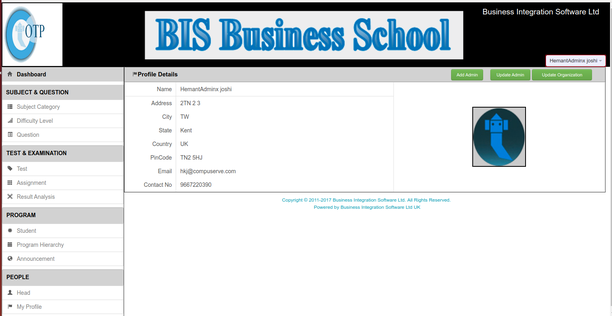 A registered student can enter the correct credentials and begin the assignment by a single click. By observing the above features of our Online Exam System, it is clear that the system is adaptive and cost-effective for both organizations as well as for the candidates. Online Exam System Student exam results are analyzed by the system automatically and the results can be viewed question by question. Exam results and the grading can be viewed in the PDF format with an email facility. Results are analyzed for Category, Sub-Category, and Topic. Overall performance can be configured for the organization. Online Exam System has Exam Builder Engine which enables grades given in percentage mapped to the desired name like DISTINCTION, VERY GOOD, PASS, BELOW AVERAGE etc.